The Sooty Falcon (Falco concolor ) is a medium-sized falcon. This species breeds on islands and coastal or desert cliffs in northeast Africa from Libya to Israel and the Red Sea. It is a long-distance migrant, wintering in east Africa and south to Madagascar. It is rare north of its breeding range. The Sooty Falcon is an elegant bird of prey, 32-37 cm long with a 78-90 cm wingspan. It is like a large Hobby or a small Eleonora's Falcon, with its long pointed wings, long tail and slim body. The adults are blue-grey, and lack the black underwing coverts of the Eleanora’s Falcon. 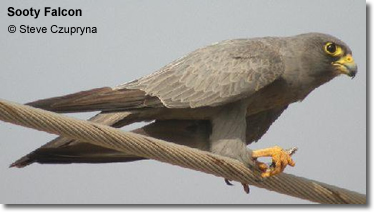 The young bird is like a large juvenile Hobby, or small juvenile Eleanora’s Falcon. Its dark trailing edge to the wings and tail distinguish it from the former species, and it lacks the underwing contrast caused by the dark coverts of the larger falcon. It nests on a ledge or on rocks, laying up to four eggs. The Sooty Falcon eats mainly birds, but it will take large insects, such as dragonflies, which are transferred from talons to beak and eaten in flight.